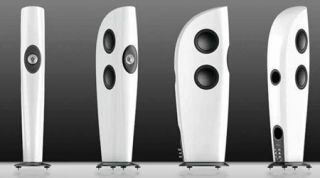 MUNICH SHOW: KEF celebrates 50th anniversary with flagship £20,000 Blade speakers | What Hi-Fi? It was at the Munich Show two years ago that we first set eyes on KEF's futuristic Concept Blade speakers. At the time they were just engineering prototypes, destined to do the rounds of various hi-fi shows and demos. But now all that development work has come to fruition in these, the production-ready KEF Blade. Although derived from the original Concept Blade, KEF says there are several significant upgrades to the earlier design. At the heart of the KEF Blade is its Single Apparent Source technology, a new, fully pistonic KEF UNi-Q MF/HF array which "forms a seamless point source driver array handling the entire frequency range". Four side-firing 22.5cm newly developed bass drivers handle the Blade's low frequency response, arranged in symmetrical pairs so the forces of each moving cone cancel each other out. The force produced by the bass drivers is so powerful, says KEF, that massive rear magnets have had to be bonded directly to each other to obtain the full benefit of this engineering approach. All this technology is housed in a rigid, heavy cabinet made from polished glass reinforced composite. The KEF Blade will be available to order from KEF retailers in July/August for £20,000 a pair, available in gloss black or white.